– Collaborate with stakeholders and subject matter experts (SMEs) to understand business needs and translate them into learning and performance objectives. – Lead content collaboration with stakeholders, problem-solving to achieve performance objectives, and resolve issues, risks and quality challenges. – Work with SMEs and stakeholders to facilitate approvals and gain alignment on content direction, design and details. – Identify and incorporate the most effective and innovative practices in learning delivery including social and peer learning, game-based learning, informal learning, and performance support. – Seek out new learning solutions and bring innovative ideas to individual projects and the team at large. – Apply best practices in adult learning to design, write, and build a range of high-quality learning experiences, with an emphasis on e-learning, video, animations and gamification. – Curate existing content into new learning designs and paths. 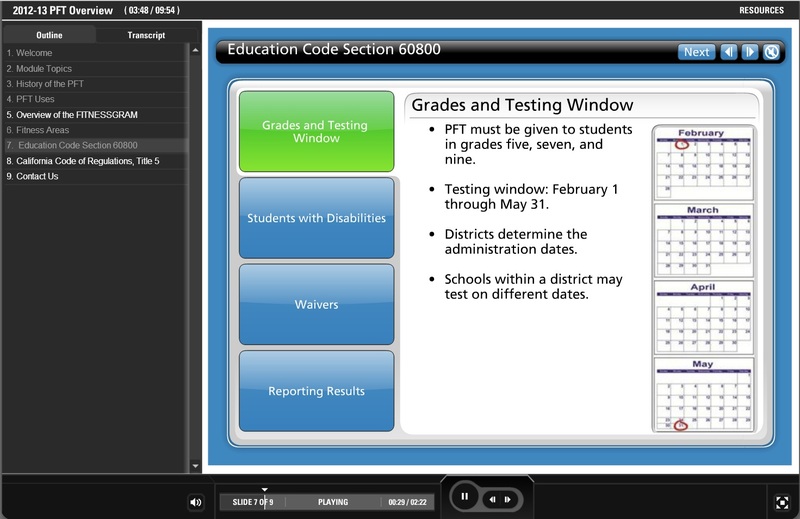 Upload learning solutions into the learning management system (LMS) and test complete solution in target environments. This portfolio is broken into three sections: assessments, screenshots of finished projects, and WBT scripts. I’ve included a description of each item in this portfolio. First off, I’ll tell you about the projects that these samples come from. 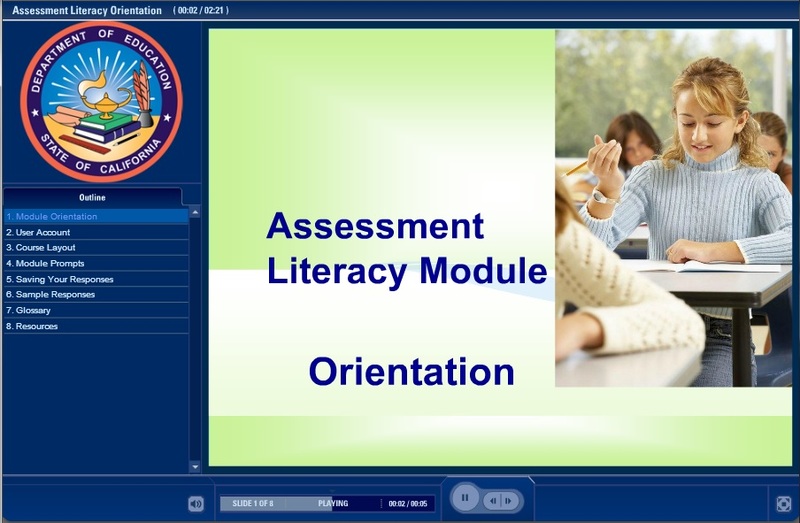 Assessment Literacy Module: The Assessment Literacy Module (ALM) is an eLearning module I wrote and designed. This was contracted through the California Department of Education. The ALM is required training for school districts throughout California supporting newly adopted Common Core State Standards. 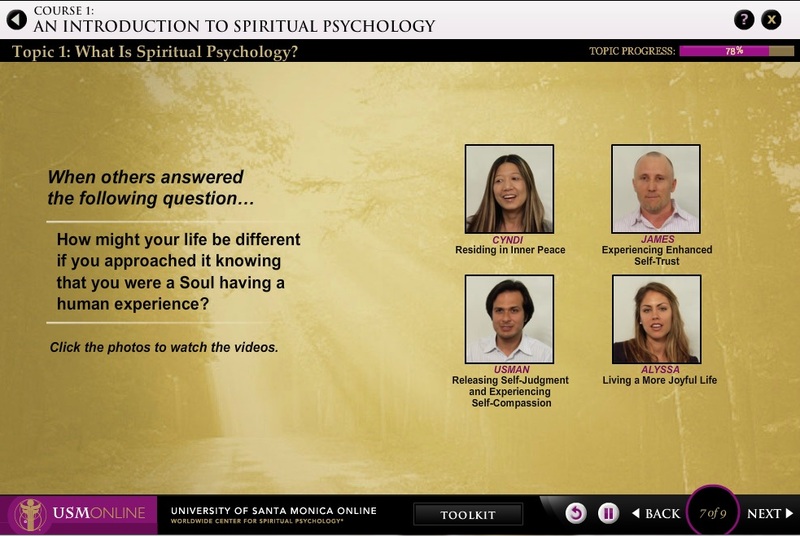 University of Santa Monica Online: The University of Santa Monica brought me on to help them turn their Instructor- Led Training course into a Web-Based Training course. This was an incredibly robust online initiative that took more than two years to launch. I worked to create the first two courses. Course 1 is a free online course for newcomers. Course 2 is the paid online course which goes more in-depth and attempts to replicate the in-person Master’s degree class. Physical Fitness Test: The Physical Fitness Test (PFT) is an eLearning module I worked on. This is required training for physical education teachers and test administrators throughout California I helped revise the module to reflect the newest educational research updates. This included writing portions of the script and adding functionality such as drag and drop and assessment to help the course engage the learners more. I also provided the narration for the course. While designing a course, I like to keep the learner engaged. One of the ways to engage learners is with assessments. This screen is an example of a multiple choice, true/false, and essay assessment. We branded our assessments in the ALM with “Time 2” titles. This way learners could quickly recognize when an assessment was coming up. Time 2 Respond is a question and answer assessment where learners read a question and type in their answer. They can also open a pop-up box to look at an example answer. This is a screenshot of the ALM Orientation that I designed for Articulate Engage. This is a screenshot of the PFT course. This is a tab functionality screen that I added to the course to make it more interactive. 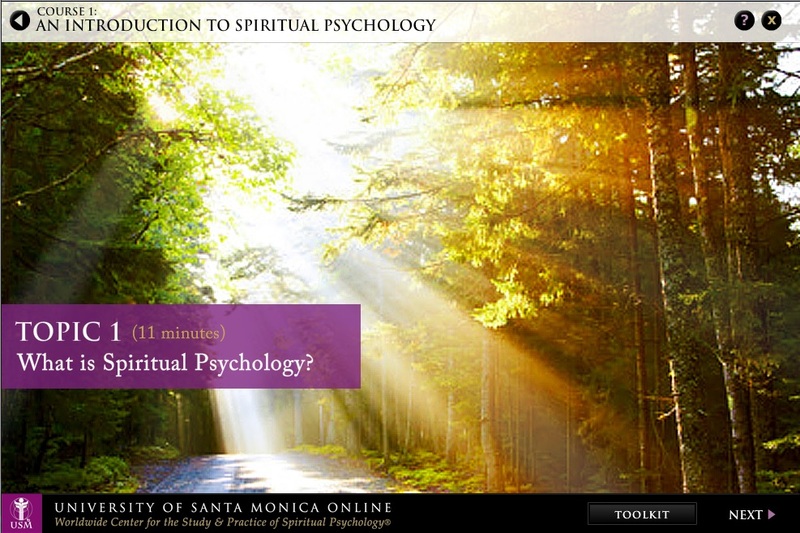 These screenshots were taken from the University of Santa Monica Online Course 1 that I wrote and designed. Psych Welcome is first screen for each topic. This screen is animated and includes narration and on-screen text. The Psych Video Screen includes links to pop-up videos of other learners who answered the same question that the learner has answered. These are mock-ups that I created in Photoshop. I helped design the usmonline.org website and wrote the content. 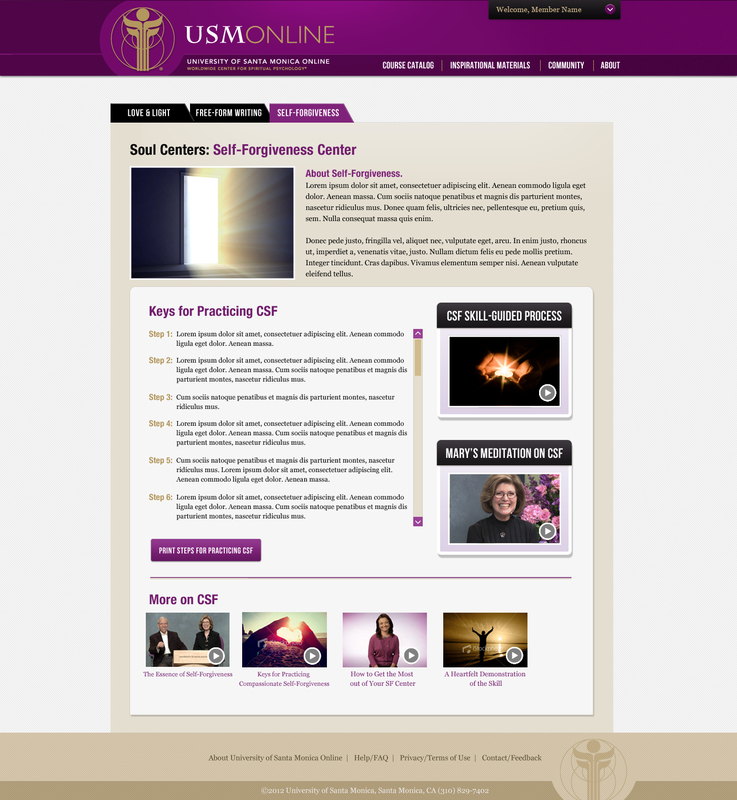 This is the first two screens of the USM Online Course 1. The script is a good example of a strictly-formatted WBT script to be designed in Flash. The Physical Fitness Test was designed in Articulate Engage. My role on this project was to crosscheck the sustainability of the course. As this is a required training course for all California PE teachers, it had to be something that was both engaging and sustainable.